IO Interactive considers Hitman’s episodic roll out in 2016 a success. Both critically and commercially, the game performed well. Additionally, fans and members of the development team enjoyed Hitman’s release taking a piecemeal approach. That Hitman 2 will abide by a more traditional release model, where the full game launches all at once, is surprising. However, IO interactive apparently made the decision long before the sequel’s announcement. The team’s reasoning? They want to serve fans, not follow a trend. We wanted to break up the sequel chain a little, and it’s also important for us to serve our players instead of following this trendy bubble of games-as-a-service. The community means a lot to us, and I think it’s a very big step for the studio as well, because this essentially means that maybe there’s a Hitman 3, and a Hitman 4 as well. And this will all appear on the same timeline. Meaning that in a couple of years you may be able to play a game that goes to over 20 locations. And that’s super exciting for us. Expanding the franchise doesn’t solely involve producing sequels. IO aims to create a world for Hitman, one where each entry from the 2016 release and beyond all talk to one another. The first step is already in motion, as 2016’s missions are being updated for Hitman 2. For players that own Hitman, its remastered levels will be available free of charge as DLC when the sequel launches. 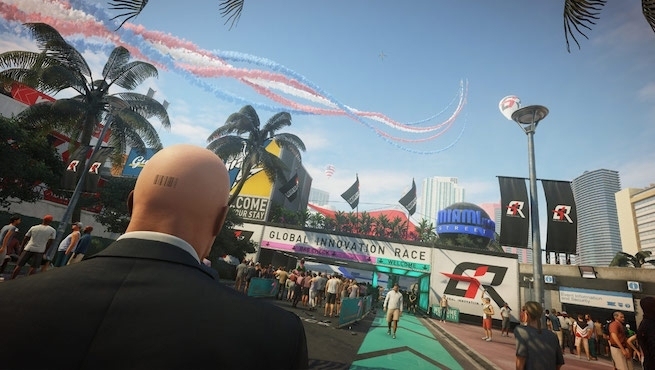 In touching on what worked for Hitman’s episodic roll out, Liebold said Hitman 2 strikes a balance between pleasing those who enjoy episodic content and those that want everything available at once. But then we had people who were not so happy with that format. So for Hitman 2 we wanted to bring everyone together so everyone’s happy. There’s still plenty to learn about Hitman 2 before it arrives on November 13, 2018. Two of the game’s six locations have been unveiled so far—Miami and Colombia.